UC Berkeley Lower Sproul Plaza Redevelopment | Inspection Services, Inc.
Lower Sproul Plaza and the surrounding mid-century modern student center complex, on the south edge of the campus of the University of California, Berkeley was built in 1959. The open space, modeled on the Piazza San Marco in Venice, was designed by the celebrated landscape architect Lawrence Halprin. New construction and adaptive reuse were combined to celebrate and revitalize this historic complex that includes Lower Sproul Plaza, Alumni Quad, portions of Upper Sproul Plaza and the Cesar Chavez Student Center. 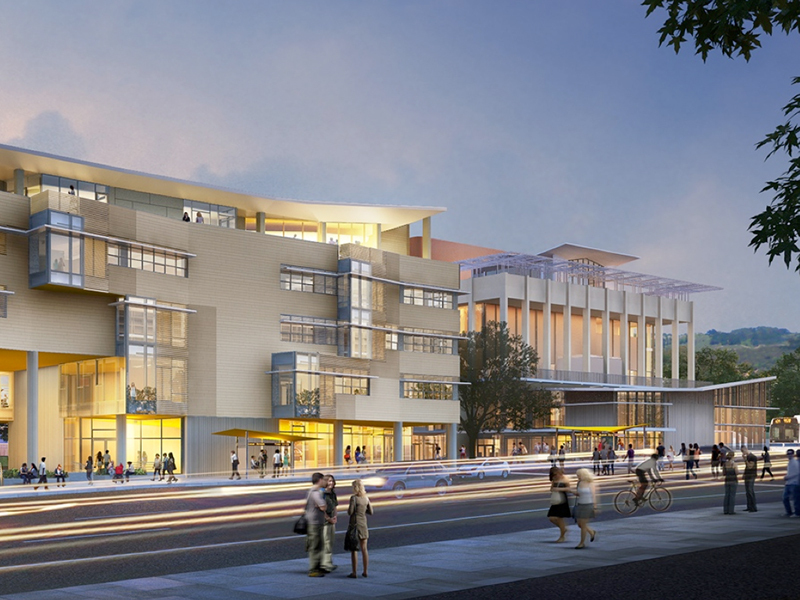 The Lower Sproul Redevelopment Project creates a true heart of student life on campus and a central meeting place where students can congregate, socialize, study, work, discuss, and debate. The program included a number of different projects as well as improvements to the plaza: Lower Sproul Plaza has new planters and trees along with more seating to help make the space more inviting. A rain garden at the west end of the plaza is designed to capture storm runoff, Eshleman Hall was replaced with a new building that is now connected to the MLK Jr. Student Union with an open-air bridge, The MLK Jr. Student Union was upgraded and new space was added to on the sides facing Lower Sproul plaza and Bancroft Way. The Pauley Ballroom and existing meeting rooms on the upper floors of the building were also renovated, Alumnae Hall on Haste Street, adjacent to the new Anna Head student housing, was seismically upgraded and renovated, Upgrades to the Cesar Chavez Student Center included new flooring and paint, remodeled restrooms and improvements to the building’s mechanical systems, Anthony Hall was seismically upgrade and renovated.